What will ultimately be the deciding factor on net neutrality is how much online outrage about the FCC’s proposed rules translates into offline action. On May 15, the Federal Communications Commission approved with a 3-2 vote to go ahead with its proposed net neutrality rules. These rules, although claiming to protect the open Internet, would actually enable websites and service providers that can afford it to pay for prioritized access online. This foreshadows a future in which wealthy corporations can reach consumers on an Internet fast lane, while the world of independent blogs, alternative media and the voices of marginalized groups are consigned to an online dirt road. Fortunately, these rules are not yet set in stone. The FCC has issued a “notice of proposed rulemaking,” which essentially means that it has announced and made public the rules it would like to pass. Those rules are now open to public comment for four months, until September 10. However, public comment alone is not likely to have much impact in the face of concerted lobbying from Internet Service Providers, or ISPs, such as Verizon and AT&T, which means that activists will need to keep the pressure on in the coming months. The tenuous victory that activists can claim is spurring the FCC to acknowledge the option to reclassify broadband Internet service as a “common carrier” under Title II of the Communications Act. Currently, ISPs are classified under Title I as “information services,” a category that carries far fewer regulations than Title II. Accordingly, reclassification of ISPs from Title I to Title II is the rallying cry of net neutrality’s staunchest defenders. Under Title II the FCC would be empowered to regulate ISPs, preventing paid fast lanes and the blocking of or discrimination against websites. But the FCC would not even be acknowledging the possibility of reclassification were it not for a massive outpouring of support for net neutrality, both online and in the streets. On May 15, actions were held in 19 cities around the country. A nine-day-long encampment in front of FCC headquarters in Washington, D.C., leading up to the vote brought pressure directly to bear on the five FCC commissioners. Greer says that the impetus to occupy in front of the FCC headquarters came directly from Fight for the Future’s online base. Margaret Flowers, an organizer with the Maryland-based activist group Popular Resistance, helped to launch the encampment in front of the FCC, which lasted for more than a week. Flowers says that her group and its allies brainstormed about ways to both get the FCC to take public opinion more seriously and to get that opinion reported on in the media more frequently. Aware that even a well-worn tactic can be applied to a new situation and achieve results, they set up their encampment on the sidewalk in front of the FCC. That power translated directly into FCC Chair Tom Wheeler acknowledging the possibility of reclassification of the Internet as a common carrier in the public comment period. In the FCC’s view, the purpose of the comment period is to specifically hear from the public about whether its proposed rules or common carrier reclassification would be a better choice. As Flowers and her fellow organizers predicted, the power of their action came largely from how unexpected it was to the FCC. Over its nine days, the encampment held between 25 and 50 people at any given time. According to Flowers, at its peak on the last night of the occupation, the encampment consisted of people sleeping in 10 different tents. With the FCC now officially considering reclassification as part of public discourse, the power of grassroots activism on this issue is clear. For the FCC to be even talking about reclassification is a huge coup for net neutrality activists as it represents what ISPs have lobbied hardest against. Now the 120-day comment period will be crucial in deciding the future of the Internet. It will be up to grassroots activists to exert enough pressure to make reclassification a more appealing political option than caving in to ISP lobbying. So the question becomes: How do everyday users of the Internet exercise their collective counter-power in the face of the political entrenchment and financial resources of the telecomm lobby? And that very well may happen. Flowers says that organizing is already underway to plan regular actions throughout the comment period. Organizing teams are taking root in the cities that held a day of action on May 15 and beyond. These teams hope to bring pressure to bear on the FCC, which is not used to being directly protested, at its Washington, D.C., headquarters and at regional offices around the country. 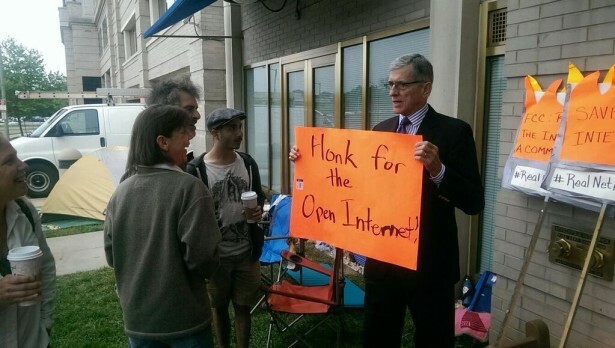 Reclassification of the Internet as a common carrier service will be the main rallying cry of these protests. But there are other specific pressure points that activists can exploit. One new demand is for President Obama to demote Tom Wheeler from his position as chair of the FCC and replace him with another Democratic commissioner. Fight for the Future has just launched a petition to this effect online. Commissioners Rosenworcel and Clyburn have expressed more openness to real net neutrality than Wheeler — or, at minimum, a desire for the process to move more slowly so that the public’s perspective can be fully accounted for. More specific demands may be identified in the coming weeks. But what will ultimately be the deciding factor is how much online outrage about the FCC’s proposed rules translates into offline action. In building any movement, being able to clearly communicate the issues is of key importance. This is why reclassification of the Internet has become such a focal point in net neutrailty organizing, despite the fact that there are alternative solutions that could achieve the same goal of an equitable Internet. Nonetheless, other groups and individuals have taken up alternative strategies. Mozilla, the non-profit organization behind the popular Firefox web browser, crafted a proposal that uses a legal slight of hand to achieve the same benefits as Title II reclassification while avoiding the legal and political obstacles that reclassification entails. But while Mozilla’s proposal may be a favored solution among policy wonks and the technorati, it lacks the clarity of message that would help it become a grassroots rallying cry. Another solution that has gained attention in recent months is municipal broadband, in which the local Internet infrastructure is owned and operated by a local government and offered directly to the public at a much lower cost. The municipal broadband in Chattanooga, Tenn., is one of the most celebrated of these initiatives. However, many legal barriers to municipal broadband are currently on the books at the state level. And if those barriers were to be removed, it would then require lobbying local governments to actually build the networks. Accordingly, a multiple step program like this is not as compelling an option for organizers trying to build a mass movement. With the stakes so high, it is a natural decision for organizers to use the framing that can best help the burgeoning movement grow. Keeping net neutrality has consequences that extend beyond the online world. Today we use the Internet as a core way to communicate with each other on a person-to-person level, without intermediaries. As such, it has also become a key way for us to organize politically. Flowers offered up a recent example from her own organizing work. When the media was largely failing to report on the Trans-Pacific Partnership, which will entrench the supremacy of international corporate property rights, the Internet was the only way to get the word out about the issue. “We were able to get around that media blackout and build a movement using the Internet as a tool to communicate with each other,” she said. A lack of net neutrality would disproportionately affect marginalized communities such as people of color and the poor.